We’re going to make some money today, boys and girls. Yours truly has been a little under the weather lately, but handicapping this card has brought me back to life and I feel a big score coming. Or, my meds are goooooooodddddddd. Anyway, in the opener, I really love the #2 LUREY AN, although she’s gonna come at a short price–but a winner’s a winner. We have Corey Lanerie on the #1 LUCY’S TOWN, and on Lurey An, we have Irad Ortiz Jr. Look at the other jocks lined up in the gate. I’ll take my chances with Irad (Note: I’m a big Sophie Doyle fan but that mount leaves plenty to be desired). So, Irad, Corey, then Euclyn E. Prentice Jr. in that order in the first. A short field but we’re going with a 10-1 morning line shot that has never hit the board before. That means we’ll probably get north of 12-1 when the gates open, and the higher the better. #4 PARADE FIELD is a bold choice to be sure, but I like how he’s been gaining position in the stretch of his last three races: from 10th to 5th last out, 6th to 4th two back, and 9th to 4th three back. He should sit off the pace here, and hopefully he’ll have some extra drive and with a short field, has less horses to catch late. #5 ROYAL MESA is a logical win contender finishing second the last two while garnering better speed figures in each career race. Gotta look to the outside for this one mile turf MSW affair. #11 LIFE MISSION and #12 BAR HARBOR look the best on paper, and if you want to go cheap in the multis, just use these two. Life Mission has never finished outside the superfecta, and has been second-best three times in six starts. Bar Harbor placed in his first career start and any improvement on that performance makes him tough here. #1 I CAN DO ANYTHING and #2 NORTH POINT are both worth a second look. Looking for #2 BEANTOWN BOYS to win back-to-back races for the first time in his career (this will be his 25th start). He projects to sit well behind the early pace, much like he did last out, winning at Santa Anita in February on a sloppy track. #10 CONQUEREOR should be the early pacesetter, and is looking to win for the second time at this distance (4-1-2-0 so far). You know Peter Miller will have his gelding ready to run. #3 IKE WALKER is another logical contender to use. I’m liking a lot of double digit posts today and that’s not normal. I don’t think I’ve ever played a 10-11-12 trifecta, either straight or boxed before, and I’ve been doing this for about thirty years. But, the best three horses in this race break from those posts. I HAVE bet #10 COACH ROCKS before, and was disappointed, so she owes me. I saw Dale Romans yesterday (but missed Bill Murray) so maybe it’s a sign–if seeing a trainer at a racetrack can be a lucky sign. Coach Rocks is running second off the layoff after finishing an uninspiring third in an allowance at Gulfstream 44 days ago. This is obviously not the race she’s been pointed to, but if she fires like she has in the past, it’s all over. Top-threat. #11 GIO GAME is making her first start in 238 days, but she has the ability to run with most of these here. #12 ABOUNDING JOY is trying a mile for the first time and is running 56 days after her first race from a previous 265 day layoff. Look for all three of these to expertly sit behind a fast early pace and pounce at the meltdown. #6 FIBER OPTIC should see them all early in this one mile allowance race on the turf. The four year old by Morning Line is contesting three more panels today than her winning debut when she won a $50k MSW five furlong turf sprint at Gulfstream Park on March 10. She’ll obviously have to tackle this race a bit differently, but there’s a chance this one has some real talent. #9 FLAT MEADOW should sit off the brisk early pace while she looks for her first victory since last June. #7 MALAKEH will probably be the post-time favorite as she has performed well in Group 2 stakes races overseas. In the Grade 3 Ben Ali, I’m siding with #4 FLAMEAWAY third off the layoff for trainer Mark Casse and jockey Irad Ortiz Jr. Unable to defeat Harlan Punch or winner Silver Dust in the Grade 3 Mineshaft at Fair Grounds in February first off the layoff and following a vet scratch on January 26 at Oaklawn, he found the winners circle for the 6th time of his career last out in a Tampa stakes race. My second choice #10 NUN THE LESS won twice at Turfway Park over the winter. Horses who have won stakes races (and top-tier allowance races) at Turfway have fared well at Keeneland this meet. With horses like #5 HENCE, #6 SOLOMINI and Todd Pletcher’s #8 BONUS POINTS all taking money, Nun the Less could be a forgotten entity in the race and bring a big price underneath in exactas and trifectas. #1 JUST WHISTLE is another to consider. Any combination of 1,4, and 10 will do. In the Lexington, I love #4 ANOTHERTWISTAFATE’s high cruising speed. His El Camino Real victory was visually impressive, and he basically repeated that performance although finishing second to Cutting Humor in the Sunland Derby. He may not be a Kentucky Derby favorite, but beating these other nine runners on this day isn’t asking too much. #3 SUENO is very intriguing, and he keeps improving while getting shorter breaks between race days. He’s coming in 21 days since his third place finish in the Louisiana Derby and a repeat of that performance puts him in the mix here. #9 ZENDEN is intriguing inasmuch as he’s probably going to have to wire this field and all signs point to he’s gonna try. #7 KNICKS GO may have something to say about Zenden getting an uncontested lead, but you can toss the 7th place finisher in the Gotham and 5th place finisher of the Sam F. Davis. #10 ROILAND’s Louisiana Derby was over before it started as he missed the break. He pressed midway through the race but was done early. He could be the price underneath, especially if Knicks Go and Zenden set a ridiculous pace. I’m going to admit I’ve REALLY STRUGGLED with my top-choice here. My heart says #2 RUSHING FALL, my brain says #4 RYMSKA and this time the heart wins. Truly, either one could win this race. Rushing Fall obviously has question marks coming in 182 days after winning here in the mile and an eighth Grade 1 Queen Elizabeth II Cup. She’s only lost once in her career, finishing second to Toinette in the Grade 3 Edgewood at Churchill last year. Rymska, on the other hand, is coming in very much in form and off a Grade 2 victory, taking the Hillsboro at Tampa Bay Downs last month. On her best day, Rushing Fall wins this race way more often than not. On this day, it’s a toss-up, but my heart belongs to her–today. 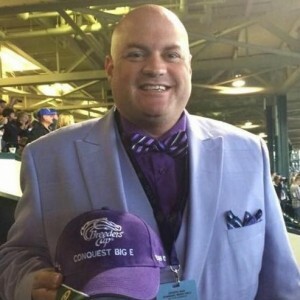 I want to sincerely thank my great friend and cohort, Ryan Dickey, for taking over this week and providing the handicapping details for Keeneland. He has soldiered on despite a battle with pneumonia, in his first full Spring experience with Kentucky Allergy Season. In the “meanwhile,” as Stephen Colbert would say, I am managing to soldier through a tough week in Key West, FL with my wonderful companion, friend and lovely wife Leigh Ann — in our annual post-Legislative Session retreat. It is our custom. It is our tradition. And, this year I have managed to enjoy the sanctuary of life without having a trip to the hospital. So, thanks to Ryan and thanks to LA for providing a wonderful respite before the rigors of Derby 2019. I’m gong with Sueno (3). I thought his run in the LA Derby was a good one before he tired late and gave way to both By My Standards and Spinoff in the late going. I think that conditioning, along with the fact that this race is a 1/16th of a mile shorter will help, especially over a racetrack surface that has favored speed for much of this meet — especially on the “short” two turns, when the finish line is moved up in the stretch. Keith Desormeaux won this race a year ago with My Boy Jack, and I think he brings a loaded runner into this one, as well. I will be Sueno (3) to win/place/show and then key the 3 over/under Anothertwistafate (4), Harvey Wallbanger (5) and Zenden (9). No doubt about it. Going with Improbable (1). This son of City Zip ships in for Team Baffert and back to the site of his only career defeat to date — Oaklawn Park. Ran a nice second off a long break in a division of the Rebel Stakes in the last outing here. But gets the services of one Jose Ortiz in the saddle today. First career ride for Ortiz with Team Baffert. When you put Baffert, Ortiz and Improbable together? A terrific mix. I don’t think they touch him in here today, as he takes a giant leap toward the KY Derby. I will play the 1 to win/place and then key the 1 over/under Galilean (7), Country House (8), Jersey Agenda (10), and Long Range Toddy (11).